While I was down and out for those few weeks, dealing with the world spinning out of control and increased pain and flu symptoms ~ and the sadness that comes along with it all ~ I was nominated for FOUR awards by my fellow bloggers. The stars aligned in those days to remind me that I have value and to keep fighting. I also had so many comments from all of you (to which I still haven’t replied ~ I’m on the cusp, gaining ground, but making mistakes with pacing and trying not to slip backwards). Please PLEASE know what it meant to me to read your hang-in-theres and stay-strongs and you-are-not-alones. I can’t even imagine the level of loneliness and isolation some of you experienced having this disease before the internet. You are warriors! It was hard not to repeat some of the blogs I nominated a year ago and I wanted to especially mention Dreams at Stake, Emotional Umbrella and No Poster Girl ~ these are three ladies that I would love to sit with around a dinner table and talk into the wee hours. 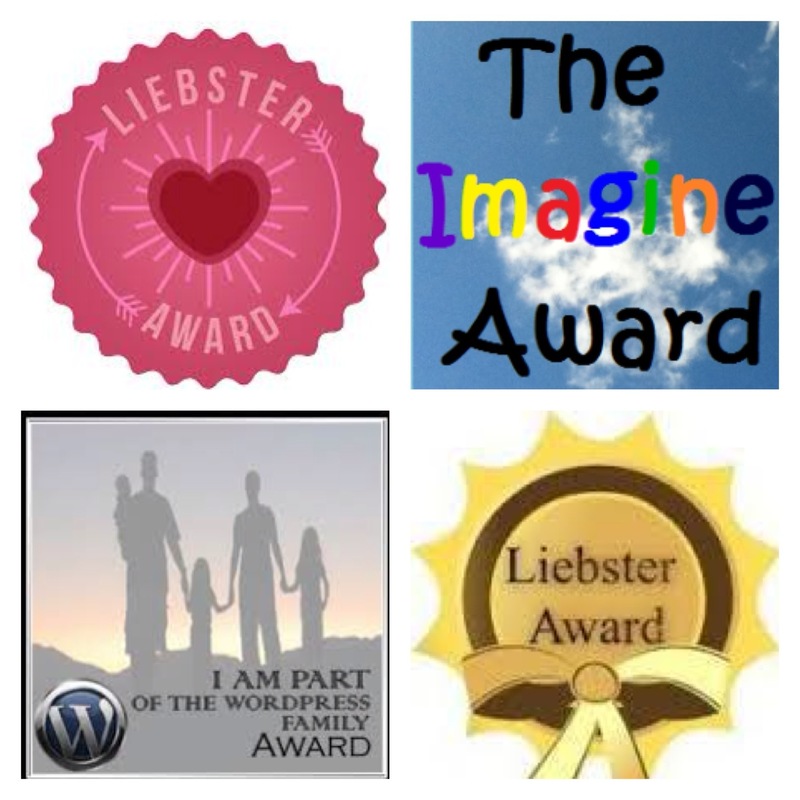 I want to thank Jess at My Journey Thru ME and Marie at CurranKentucky for nominating me for the Liebster Award and for the kind words they said about my blog on their posts ~ I’m very flattered! Jess lives in London with her husband (boyfriend?) and had to leave her job as a solicitor after coming down with ME almost 3 years ago. Her blog is inspiring, informative and upbeat. She is currently experiencing a bit of energy revival and I can’t wait to see what the future holds for her. Marie lives with her husband in Galway, Ireland (one of my favourite places on the planet). ME came into her life about a year and a half ago and, although she used to work, travel, train horses, and run marathons, she has kept a patient, yet fighting spirit through her illness. She also found poetry, which she writes in almost every post ~ one of the many reasons to follow her blog. Donna at yadadarcyyada nominated me for the Imagine Award. Me? Creative? Imagine! What a compliment. Donna has fibromyalgia, but that isn’t what her blog is about. What isn’t her blog about? Politics, books, movies, TV shows, wonderful rants and interesting images. It is never laborious and always surprising. She has about 10 times the number of followers I do, if that tells you anything. Jenn at My Fibrotastic Life nominated me for the “I Am Part Of The WordPress Family” award, which I’d never heard of, but the sentiment is wonderful and I truly appreciate the shout out. Jenn has fibromyalgia, but blogs about so much more. She has an Arts and Crafts Gallery, she has an online store to sell her creations, and her blog is upbeat with amusing photos and creative cartoons (she is, after all, the inventor of the Imagine Award). But don’t be fooled, she is also wonderfully honest about the evils of her illness. This entry was posted in CFS/ME and tagged Awards, blog, dysautonomia, ME/CFS. Thank you, Elizabeth. Someday, if ever I’m able, I would be honoured to share a dinner table with you. Excellent, looking forward to it! Thanks for the mention, Elizabeth! Will have to check out your selections. My pleasure. Your blog has meant so much to me since I got sick, so thank YOU! Hi Elizabeth. Great idea, great post! Thanks for much for the s/o – that means a lot to me. I definitely intend to pay it forward. Am taking a little informal blogging hiatus until after I move into a new home in late November, but intend to pick it back up with something like this when I’m done. Congrats on your award nominations. Those are well deserved! Congratulations! You have been having the worst time so the best time for your blog family to honour you. All of you give each other the kind of support family can’t. I love reading all of you and cheer your courage. Of course! I look forward to your recommendations.